In 2012 a generous villager had the idea of buying land and planting a wood in our village in order to commemorate the Queen’s Diamond Jubilee. A 2.7 hectare field lying to the south west of the village, and having lovely views of Glastonbury Tor and the Mendip Hills, was purchased from Somerset County Council in 2013. 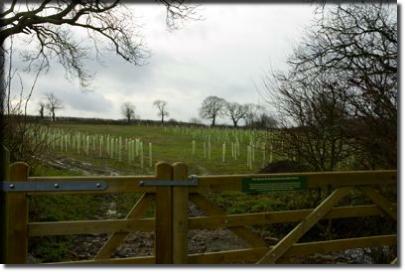 The Woodland Trust were engaged to provide a plan plus the sapling trees and shrubs. The plan included a community orchard of 20 fruit trees, a picnic table, a wildflower meadow running down the centre of the land and a bog/pond area at the bottom of the field. A project manager, Alistair Eaglesome, was appointed and a small committee was formed to oversee the establishment and maintenance of the wood. Planting day was arranged for 23rd November 2013. 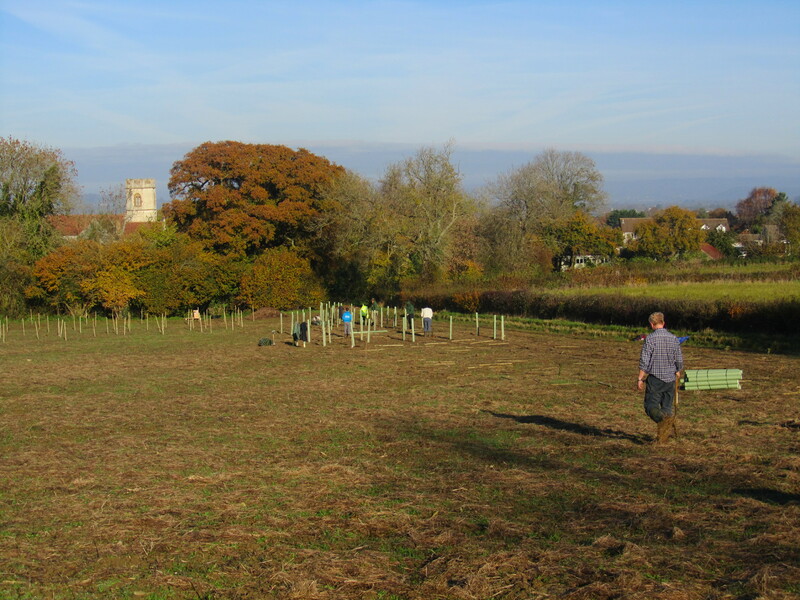 This turned out to be a very beautiful autumn day and volunteers under the direction of Alistair set about putting in the stakes, the tree shelters and the 800 or so native sapling trees and shrubs provided by the Woodland Trust. The native species included major trees – oak, hornbeam, lime and beech; minor trees – field maple, wild cherry, silver birch, rowan, crab apple and aspen; shrubs included hazel, hawthorn, guelder rose, dogwood and dog rose. The community orchard trees were planted towards the top of the field during January 2014. 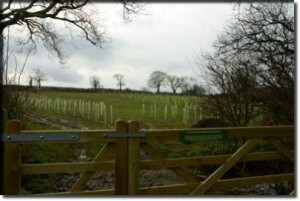 The sapling trees and the orchard trees benefitted from the very wet winter of 2013/2014 and the trees were able to establish with only a few casualties. Having said that, it has not all been plain sailing. Earlier this year (2015) it was clear we were going to have a ‘thistle’ invasion and prompt action had to be taken in order to avert a wood consisting of nothing but thistles! Also whilst busy trying to get rid of the thistles, aphids attacked the damson and greengage trees in the orchard, denuding them of leaves. Hopefully they will survive, but if not, we will replant. The wildflower meadow has established mainly from the hay that was taken from Don Clarke’s wildflower meadow at Northfield House and spread over the field prior to the planting of the wood. During April, May and June this year we had an abundance of cowslips (planted last year by Barbara King), bird’s foot trefoil, red and white clover, speedwell, ox-eye daisy or marguerite, yellow rattle, hawkweed and of course lots of dandelion, buttercups and daisies. In the bog area we have the yellow flag iris doing well and a marsh marigold is in there too and we hope that will flourish and increase in numbers. Also growing are many grasses including Yorkshire Fog and Cocksfoot and these attract different types of butterflies including the Meadow Brown, the Small Skipper and the Common Blue. In the hedgerow, amongst other things, we have English bluebells, guelder rose and wayfaring tree (viburnum). On the track leading to the wood during February we had lots of snowdrops already established and English bluebells have been planted which we hope will establish over time. We did spread quite a few Flanders red poppy seeds but they are tricky little blighters and we just had a few flowering last year, none at all this year. Apparently they just like freshly disturbed/ploughed ground which is why they flowered so profusely on the Flanders fields and why they are seen in corn fields. Peter (Farrant) has kindly mown around the perimeter of the field and around the picnic table to make life easier for walkers and picnickers. If anyone would like to be on the Committee’s list of volunteers for work in the Diamond Jubilee Wood from time to time, please contact Sue Forbes email sue@forbeslcf.net . 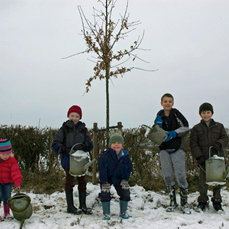 Finally, the Tree Council as part of their Diamond Jubilee celebrations gave away 60 large Jubilee Diamond trees. 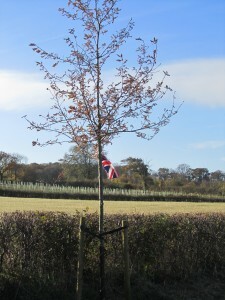 Our village was successful in obtaining one of these 60 trees and an English Oak (Quercus robur) was chosen. This is planted next to a hedge near the Diamond Jubilee Wood where it is hoped it will stand as good a chance as any of still being there in a couple of hundred years’ time. It will eventually have a plaque with a QR reader so anyone passing it with a smart phone will be able to access some information taken from the Jubilee Diamond Trees book produced and sent to the Queen. The Tree Council printed a limited number of these books and there are a few copies of the book left should anyone like to have one. 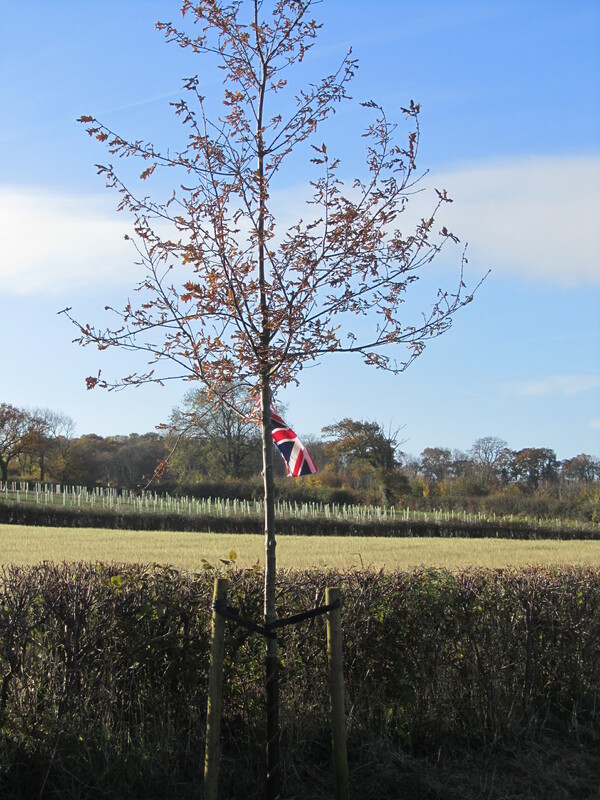 (Please contact Barbara King on 01458 850897 or email bsd.sec@gmail.com) They cost £13.95 and they have the ‘stories’ of the 60 trees planted around the country to mark the Queen’s Diamond Jubilee. 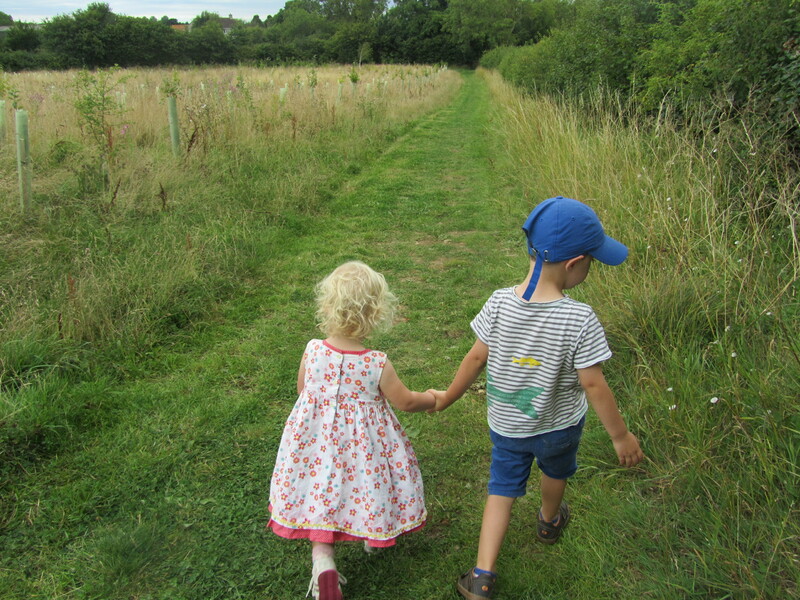 Enjoying a walk in the Wood.